Mālama Learning Center was selected as one of 82 organizations in the world to receive a grant from the Disney Conservation Fund for a partnership project based at the U.S. 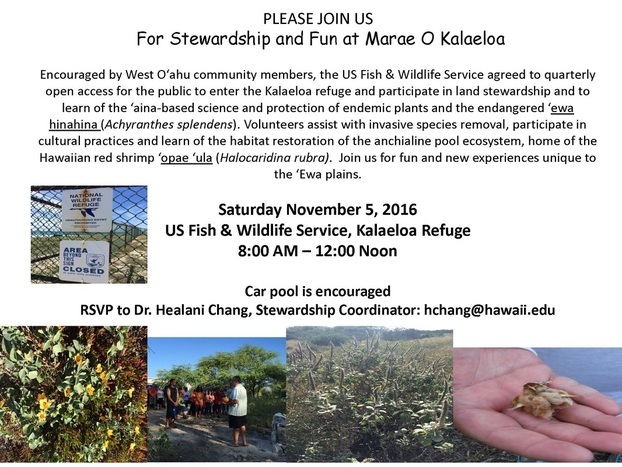 Fish & Wildlife Service’s refuge at Kalaeloa. We have been taking students for many years to the unique coastal and anchialine ecosystems there, home to rare species of ʻōpae ʻula (red shrimp). Now thanks to this grant, we can do even more by supporting community- and cultural-based conservation and research efforts that have grown at the refuge. Connecting Western Science and Indigenous Knowledge at Kalaeloa, part 1 from Malama Learning Center on Vimeo. ​On November 7, 2015 we joined a group of community volunteers in planting more than 50 native plants grown at the Kapolei High School native plant nursery around the newly built ahu, creating a place where students and other visitors can center themselves before entering the refuge. Even Safari Minnie helped by planting a maʻo (Hawaiian cotton) plant! We had a great time learning and helping restore the endangered ‘akoko plants and the ultra-unique anchialine pools in Kalaeloa! The group became part of the land during an opening ceremony led by Uncle Glen Kila and Chris Oliveria of Marae Ha`a Koa, where each volunteer added their personal mana, in the form of coral, to the newly established ahu. This powerful opening ceremony added to the ethereal aura that this habitat already had to offer. After hours of good company, rigorous work, and delicious brownies, the group was able to decorate the ahu, surrounding it with newly planted hinahina kū kahakai. These plants will later grow, blossom, and fill the air with the soothing kahakai fragrance that the plant is known for. 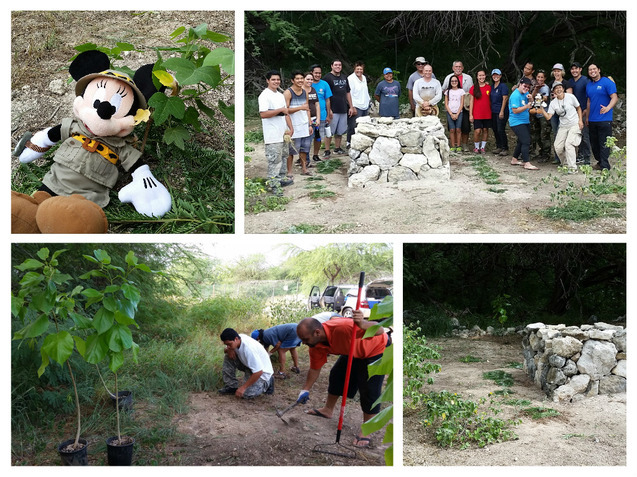 Native plants like ma’o, akulikuli, pa'ū o Hi'iaka, kou, and ‘ilima were also planted at the hands of Minnie’s group. At the end of the day, as the group celebrated their accomplishments, they shared a surreal moment with the land. It can be described with a saying, “Aloha Kekahi I Kekahi,” meaning “to love each other." The volunteers showed their love for the land by nurturing it and respecting it, and in return the land showed the group love by cooling them all down with a reviving shower from the sky. We think our supporters at Disney would agree that moments like these are truly what dreams are made of. ​Our group's work came just in time for a visit from the Deputy Superintendent of the U.S. Fish & Wildlife Service, Mike Connor. He was impressed with our community-based efforts and planted a ma’o to commemorate his visit. 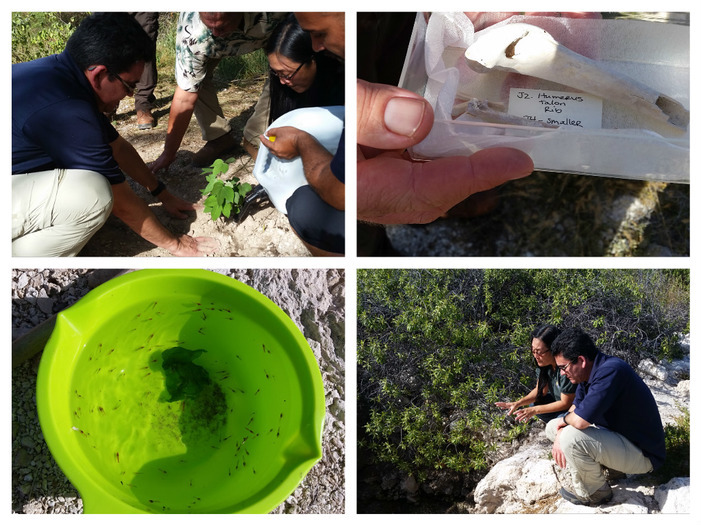 Then with the help of biologist Lorena “Tap” Wada, he got to see close-up the ʻōpae ʻula of Kalaeloa and hear how the dedicated staff and volunteers of the US FWS helped save them from decades of abuse (e.g. dumping of rubbish in their anchialine pools). It’s a great story of perseverance to save some of the smallest and least known species.